NATIONAL SINDHI SAMMELAN – 17TH, 18TH APRIL 2011. The National Sindhi Sammelan was held in Raipur (Chhatisgarh). Approximately 7 – 8 thousand delegates had come from outside the state. The Sammelan began at sharp 11-00 a.m. on 17th April in a grand hall. The inaugural speech was delivered by the Vice President Shri Navalrai Bachani. Other members of Bhartiya Sindhu Sabha present on the dais were – Shri Ghanshyam Kukreja, Radhakrishna Bhagia (General Secretary), Gautam Samrat Ladharam Nagwani, Vishal Dariyani, Vasudev Vaswani, Govind Ramnani, Veena Bhatia. The Programme began with the traditional lighting of the lamp by the Chief Guest of the morning function Saint Shri Yudhishter Lal (Present in-charge of the Pujya Thadhani Darbar) along with Srichand Sundrani, Maya Kodwani, Shivo Kotwani. Shri Radhakrishna enlightened the audience about the purpose of holding this Sammelan viz. to inform about the annual programmes organized by each state and the steps taken to preserve Sindhi language and culture. He also mentioned about the social service towards the Sindhi community and steps adopted for the promotion of the organization by Bhartiya Sindhu Sabha. A tribute was offered to Shri Jhamatmal Wadhwani on his 4th death anniversary which was on the same day. Giving the report Gautam Samrat from Gujarat related the various works undertaken. Veena Bhatia, the vice president of the women's wing spoke about Sindhi language and cultural programmes organized by them. During the second half of the function, in the evening at 4:00 p.m. the Chief Minister of Chhatisgarh Dr. Raman Singh also participated along with Honorable Shri Lal Krishna Advani, Shri Ram Jethmalani and Minister Shri Brij Mohal Agarwal. Shri Ram Jethmalani mentioned that Sindhis, who have a sharp mind, should stay away from flattery, rivalry, sycophancy, back-biting etc. Shri L. K. Advani explained to the non-Sindhi journalists the importance of the name – Bhartiya Sindhu Sabha. He stressed the point that Sindhis should speak in Sindhi at home. In the evening two praise-worthy dramas by children were presented by Haresh Kakvani. On Monday 18th April 2011, the Chairman Shri Murlidhar Makhija commenced the proceedings, in which three important points were put forward. 1. The contribution of Sindhi women folk : Sheela Dudani spoke on this subject and Neelu Megh clearly said that the mother influences the child right from the time its in her womb. If the mother speaks with the child in Sindhi for the initial 5 years then that child will never forget Sindhi. Asha from Bhopal said that the children will love to learn Sindhi if we teach them through cultural programmes by showing them on C.D. Dr. Nirmala Wadhwani from Ahmedabad gave a very good suggestion on this topic. Asha Kundnani said that the mental impressions should be sowed in the minds of children by the mother and grandmother. 2. Dr. Maya Kodwani said that Sindhi women have inferiority complex while speaking Sindhi. She told them to get rid of it. Even she stressed that the influence of mother on the child starts right from the womb. (Just as Abhimanyu had learnt the technique of Chakravyu in the battle, while he was in Subhadra's womb, when Arjun was narrating it). The President of Youth Sindhu Sabha Shri Ashok Advani also put forth his thoughts and in conclusion Tulsi Setya from Nagpur spoke about the role of Saints in the promotion of Sindhi language. 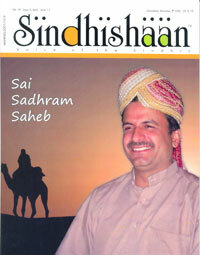 Sindhu Swabhiman the souvenir magazine which was released at the Sammelan contains many articles conveying inspirational messages. It has been published in the Devnagri script so that the children (most of whom don't know the Arabic script) can also read. Hope this good sense also prevails on other Sindhi masses, stalwarts and saints. Honorable Saint Yudhishter Lal in his ceremonial speech said that more stress should be laid on saving the Sindhi culture rather than the language. This was rather strange as the mother tongue is the identity of a community and children will identify with the culture only when they know to speak the language. First of all it should be noted that all the cities and villages in Sindh have Sindhi medium schools, Sindhi literature, Sindhi cultural programmes and also various Sindhi satellite channels like K.T.N etc. ; so the language is extensively in use. Moreover, Advani should be aware that at Bhartiya Sindhu Sabha and other Sindhi organizations, stalwarts such as L. K. Advani and Ram Jethmalani have been stressing the point that Sindhis should speak in Sindhi amongst themselves. The entire proceedings of the two day Sammelan were carried out in Sindhi language for which the organizers deserve a round of applause. Sindhi social workers while speaking in Sindhi made use of difficult Hindi and Sanskrit words simultaneously like 'Bhavishya', 'Tarun' etc. Now the question arises that when we proudly say we mustn't forget our mother tongue, then why use Hindi and Sanskrit words while speaking Sindhi? Honorable Shri L. K. Advani and Shri Ram Jethmalani also participated in the Sammelan on 17th April 2011, in the afternoon. Both of them are the stalwarts of our community, one is a precious pearl while other a priceless diamond. While felicitating and welcoming Ram Jethmalani the organizers were not up to the mark as to how a great dignitary should be honoured. A brief introduction should have been given about the various dignitaries and guests on the dais who were asked to speak a few words. This would have enhanced the grace of the dais and all those present would have got a fair knowledge about the speaker. The articles of Bhau Heman and Shri Murlidhar Makhija, the President of Bhartiya Sindhu Sabha – Chhatisgarh, not only carry weight and are quite powerful, but also give the message of not losing hope to the Sindhi community. Kamla Goklani has written about the gems of Sindhi Literature and their achievements.